Black pepper (Piper nigrum) is a common spice with a rich history. Peppercorns from black pepper have been traded for thousands of years and the peppercorn trade is still very much alive and well today. This highly sought after spice owes its fame to an alkaloid called piperine which gives pepper its spiciness. However, P. nigrum isn't the only species of pepper, actually there are at least one thousand Piper species many of them containing piperine and/or other unique compounds, some are even known stimulants. Some interesting species include Betel (P. betle), Cubeb (P. cubeba), West African Pepper (P. guineense), Long Pepper (P. longum) and Kava (P. methysticum). Not all Piper species are prized for their fruits, or peppercorns, others have highly sought after leaves. One such example is lolot (P. lolot), which is a component of thịt bò nướng lá lốt, a Vietnamese cuisine which consists of beef wrapped in lolot leaves and grilled. I will focus on propagation methods for only two species, black pepper (P. nigrum) and lolot (P. lolot), although these methods will likely be effective with other species of Piper as well. Soak in water for 24 hours (or more) until the seeds are visibly hydrated and plump. Plant the seeds about 1/4th inch in moist potting soil and keep the soil moist. 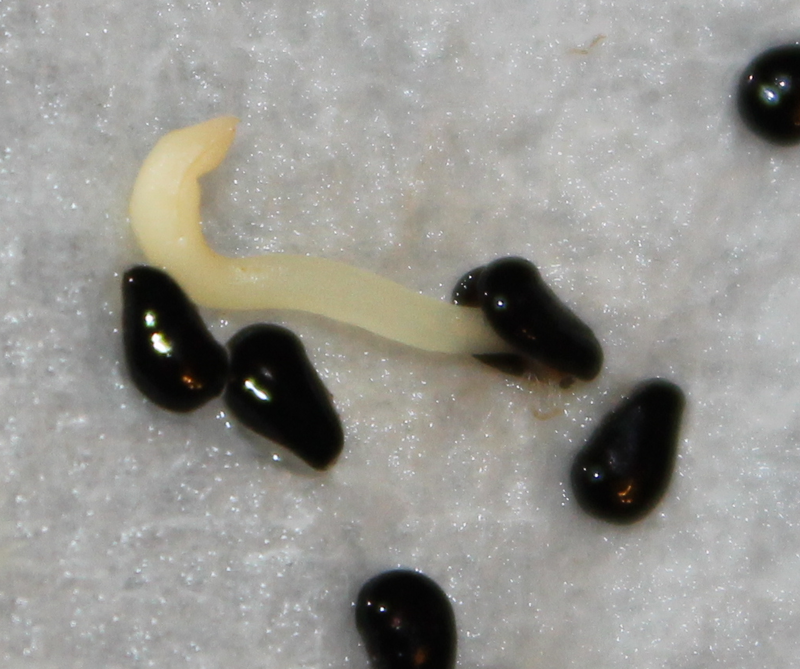 Germination typically occurs within one month. I don't know of any examples of growing lolot by seed, although this may be possible. As with many species of Piper, the preferred method of propagation for lolot is by rooting. This method is of course impossible without having a parent plant, however they are available for sale as live plants from some internet vendors as well as from some tropical plant nurseries in the U.S. The following vegetative propagation methods for lolot will also apply for black pepper. Rooting lolot is easy, simply place a stem under some soil, preferably one that is already growing low to the ground. Burying a horizontal stem, or "runner", encourages root formation and once the roots are well established you may sever the stem from the parent plant. This effectively creates a clone that can be re-potted. I have found that lolot does very well in my greenhouse, and has grown from a small plant taken from a cutting into a large three foot tall bush in only six months. It often sends out runner stems which grow along my greenhouse floor and snake between plant pots sending roots into the ground as it goes. These are easy to pull up, cut into segments and re-pot as new lolot plants. Propagating less vigorous lolot plants can easily be done by rooting cuttings or air-layering. Rooting cuttings is easy, but often proves to be a less successful technique of cloning from a parent plant. Simply find an older stem that is strong and firm, remove the leaf from the first node up, dip the cutting in a rooting hormone and place it in a new pot. The soil should be well draining and aerated, ideally containing a lot of vermiculite. Keep the soil moist as the cutting begins to develop roots.